The Instant Coffee Blanket Bus and Instant Coffee 500 artwork projects will be parked outside of VIVO during the opening launch event. As part of Instant Coffee's self-proclaimed "Year of Bright Days," they will exhibit A Bright Future, a four part public commission for 88 BLOCKS*Art on Main. Instant Coffee has a reclaimed aesthetic and a social intention that plays out over these four components: Blanket Bus: Soft and Warm, Instant Coffee 500; Say Nothing in Bright Colours; and Instant Coffee Light Bar Bus Shelter. All the components function as short moments of reprieve from as visual fields that are most typically reserved for advertising. Even though Instant Coffee often formally plays with the style of advertising it does so without a clear focused point of sale. 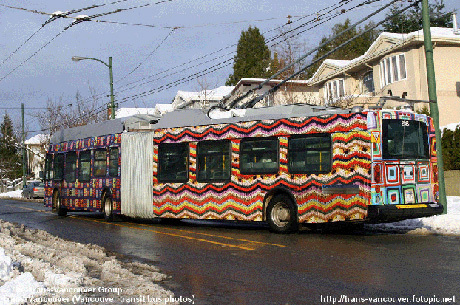 For Blanket Bus Instant Coffee has re-positioned and re-scaled the typical hand crafted afghan blanket, wrapping five sides of an articulated bus with images of these kitschy blankets. With its erratic and saturated palette and its repetitive grid line and block form, this vernacular aesthetic of the afghan is synthetically ripe, easily appropriated from its modest domestic crafting place and resituated at a larger scale into a public space, one of advertising. Since the artist collective's inception in 2000, Instant Coffee has used language as part of their practice, designing slogans like "it doesn't have to be good to be meaningful and "get social or get lost." It is through succinct catchphrases, which at times drip with the sincerity of self-help jargon, ring with the urgings of advertising slogans or resound with a dissonant irony, that Instant Coffee applies to Say Nothing in Bright Colours, a series of seven individually hand painted sandwich boards that will be permanently installed in various locations along Main St in Vancouver. Instant Coffee often invites other artists to participate in their projects and they continue this tradition for Instant Coffee 500, where they asked 14 artists to design 16 interior car ad cards to be displayed in one bus. Instant Coffee has then asked bus patrons to vote (you can vote here too!) on which artist ad card they like best. For two weeks, transit riders will be able to vote on their favorite design via text messaging and online. The winning artists will receive a $500.00 prize and their design will be featured on the outside of another number three Main Street bus for the remainder of the project. For the Light Bar Bus Shelter, Instant Coffee has adapted the Main and West 20th bus shelter into a full spectrum light therapy bar. In a place, such as Vancouver, Canada, with much darkness and rain, the negative effects from this lack of sunlight has on individual psyches and the larger social milieu seems at times seems paramount. Instant Coffee offers a moment of solace; only fifteen minutes at the bus shelter is all you need from your daily dose of vitamin D and a brighter future. 88 BLOCKS*ART ON MAIN is co-presented by the City of Vancouver and TransLink in partnership with Transport Canada's Urban Transportation Showcase Program. Planned and implemented by Maureen Smith of id a Public Art Consulting, 88 BLOCKS is a three year public art program for Main Street in Vancouver, BC with five planned exhibitions. 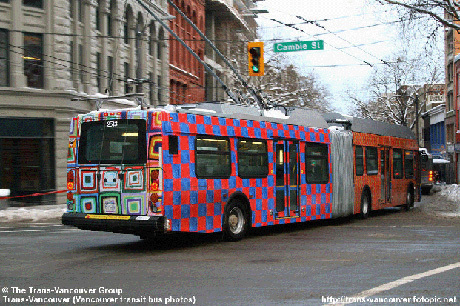 The program will launch the exhibitions in series over a three year period that will offer changing artwork on three articulated trolleys servicing the #3 Main route, several temporary artwork installations and at least one permanent installation in each exhibition at various locations along the Main Street corridor.